This is so much fun! Remember what I said about changing stuff. Because I've been keeping the fuel in the tank to a minimum, I've noticed several traits that I don't care for caused by having the regulator located at the tank. 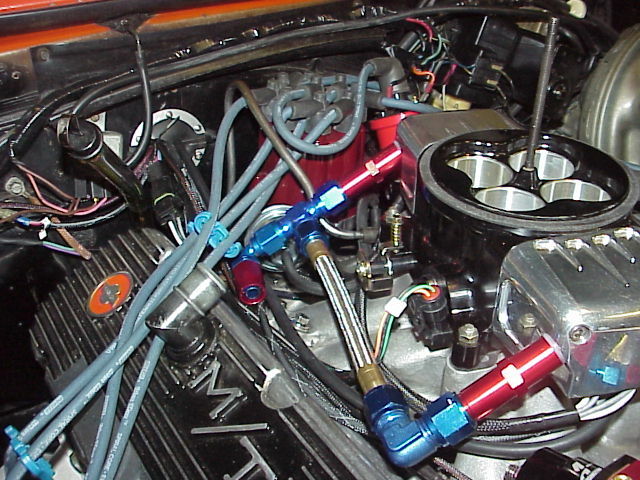 Such as air bubbles that enter the supply line have no way to purge until they are forced into the injectors, or that the pressure tends to vary at the throttle body by ten or more pounds. Solution? Why, redo everything of course! See the fuel fitting that's 'vacant'? I'm changing it to AN -8 and adding a new and larger supply line. The regulator is going to move to the engine and the original supply line will become the return line. Fun!